...it is precisely the sort of record that is immensely important for enhancing our understanding of human affairs. ...The diary that has become a book reveals the light and shade of daily life, punctuated by terrifying moments. This was the real stuff of the war at sea and it has been tellingly captured here in this book. Based on his daily diary entries that provide a vivid and accurate picture of events, the author candidly recounts his development as a merchant mariner from his early years when he served his apprenticeship from 1937-41 on Elysia, built in 1908, a passenger ship on the India run. For the remainder of the Second World War, he served as an officer on cargo ships, leaving the sea with the qualification of Master Mariner soon after a return to peacetime. At sea the war news is relayed in bits and pieces, feeding the underlying tension that keeps rising to the surface. Daily life is punctuated by terrifying episodes such as seeing ships sunk in convoy or hearing bombs drop beside the ship when in port during heavy air raids and the author also relates the horrific experience of being torpedoed. The extremes of nature that all on board had to contend with - winter storms on the North Atlantic; navigating in convoy through floe ice and avoiding icebergs; fog and the ever-present danger of collision; the extreme heat experienced in the Red Sea and Persian Gulf, without air conditioning - are all accurately described. He also relates the problems encountered when sailing on worn-out ships that would normally have been scrapped had it not been for the war, and as a consequence experiencing leaks, engine trouble and bursts of flame spouting from the funnel in areas where submarines were operating! There are glimpses of the author's moods and thoughts, sometimes funny, sometimes poignant and sometimes romantic. He displays a droll sense of humour and there are interesting philosophical comments dotted throughout the book. 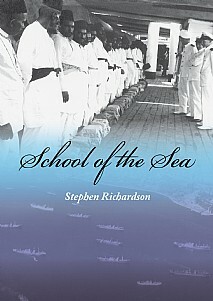 School of the Sea is a treasure house of unusual information, the kind not usually included in history books. It's personal, vivid, and entertaining and contains some wonderful descriptions of the dramas and mundane routines of shipboard society; stays in foreign ports; when on leave and the long sequestered life at sea. So much is missing from some existing maritime literature on WWII, where the focus is mainly on danger, excitement and death - this book, like no other, captures every dimension of daily life at sea and in port. This well-written and very readable book will be a delight for all maritime enthusiasts and those with Merchant Navy connections. It will also appeal to anyone looking for a good read and those who enjoy autobiographies.